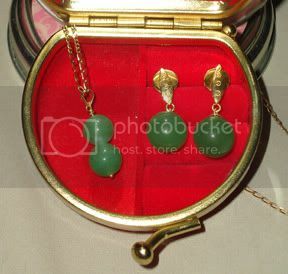 The jade jewelry set that I had custom-made by a local jeweler. Note: Written a couple of years ago. Honestly, I sometimes feel that I work too hard and there is really no just reward or compensation for myself. Most of my income goes to tithes and offerings first, then the rest are for my family, especially the needs of our little one. That means, I have a very meager if non-existent “me” budget. Although I do get a body massage from time to time, it is really more of a need because my backaches or headaches can really be troublesome. And most of these are attributed to stress. So these are not really for pampering but rather for therapy. There is also another thing about me: I kind of feel that if I buy something for myself, I feel guilt-stricken. I dunno, I can be generous with giving gifts to other people but not to myself. I love buying good things to my husband and child but as for myself, I would rather put my wants on the back seat. And I wonder where that feeling came from. But recently, I thought of rewarding myself for my efforts with this simple jewelry set. These are supposed to be expensive but I found a way to get the set for less without sacrificing my desire to have some new pieces. First, I bough some loose jade beads. Then I collected some scrap gold from my jewelry box. Then I went to a trusted local jewelry maker who also did our weddings rings and had him fashion something for me. Actually, I had an initial design but he made some alterations. And I love what he did. The settings are made of 14K gold. I wanted to have a bracelet but that is beyond my budget already so these will do for the moment.